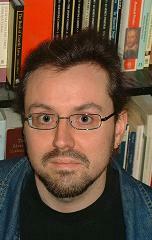 Philip Purser-Hallard's weblog, for random musings on writing, life and such other matters as arise. All material © Philip Purser-Hallard unless otherwise stated. In an effort to keep better track of my reading and book ownership than my ageing parental mind can manage these days, I recently joined Goodreads, a highly specialised social networking site which enables users to keep track of each other's reading habits, post reviews, discuss books and the like -- and, if they're authors, promote their own stuff, which I need to get round to doing properly. Given the rate at which people typically read books, it's not the busiest forum on the internet, but I'm finding it useful and fun so far. 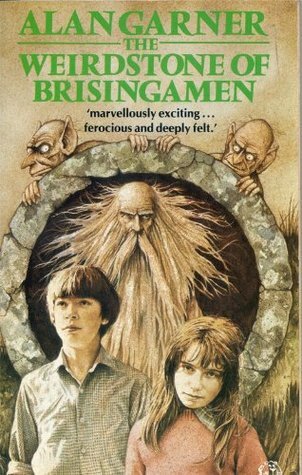 Which brings me to this: the venerable British fantasist Alan Garner recently released an adult sequel to his first two novels, the children's fantasies The Weirdstone of Brisingamen and The Moon of Gomrath . In honour of this, I reread the first two books for probably the first time since I was about fifteen, before proceeding to the sequel, Boneland . Here are the Goodreads reviews, written as I worked my way through the series. Well, Garner could certainly write, even in his twenties. The prose is bleakly, laconically poetic, the dialogue manages to be memorable rather than blandly archaic, and the book's full of images which have stayed with me in the 25 years between readings. The sequence of squirming through a tunnel deep underground may actually be responsible for my strong dislike of caves as an adult, and I found rereading those passages physically stressful, to the extent that I had to keep setting the book aside and reminding myself of where I really was. That's good writing. Amongst all that, the plot barely matters, but it's amusing to realise now the extent to which Garner simply took the story of The Lord of the Rings and reset it in Cheshire, with children playing the hobbits. The Cadellin-Grimnir-Nastrond setup is irresistibly reminiscent of Gandalf, Saruman and Sauron, and the book features dwarves, elves, trolls, farmers, mines, goblins under a different name and a beautiful woman in a forest handing out gifts (although many of these, the "mara" troll-women especially, are creatively different from Tolkien's). There's even a jewel -- the titular Weirdstone -- which has to be taken to an arbitrary place in order for the plot to end. It's obvious, though, that plot isn't really Garner's priority. (At one point, a random unexplained stranger arrives on a magic horse, gives everyone a lift from one geographical location to another, then buggers off again.) The story is compelling, which is what matters, and it acts as a framework for Garner's haunting words and images. 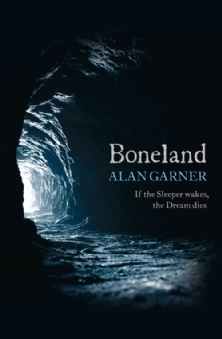 I'm following this up with The Moon of Gomrath , as a prelude to reading Garner's demicentennial sequel, Boneland . This is an altogether different proposition from The Weirdstone of Brisingamen. The prose is still bleakly beautiful, but the characters are better developed, more assertive and more independent after their experiences of the last novel, and the story is far more creative. The imagination which created elements like the mara and the lyblacs for the last book is given full rein here. The bodachs, the palugs, above all the Brollachan, are all weird and disturbing creations not found elsewhere in fantasy. That said, The Moon of Gomrath's evocation of a matriarchal Wild Magic pre-dating the masculine wizardly magic of Cadellin and co prefigures multiple examples of children's fiction, from the weird hierarchy of High, Dark, Light and Wild Magics in Susan Cooper's The Dark Is Rising sequence to Terry Pratchett's treatment of witchcraft in the Tiffany Aching books. For me there's nothing quite so memorably upsetting as the underground sequences in Weirdstone, but the developing both of Garner's cosmology and of the individual characters of the children (especially Susan, emerging triumphantly from her brother's shadow here) make this the better, more sophisticated book. The hints of Susan's and Colin's futures (we're told casually on the penultimate page that the latter "never found rest again") make the eventual publication of Boneland, if not inevitable, then something many of this book's readers have probably been waiting fifty years for. Boneland is essentially the story of the psychoanalysis of Colin, the male co-protagonist of The Weirdstone of Brisingamen and The Moon of Gomrath -- now an adult of indeterminate middle age, working as a radio astronomer at Jodrell Bank and living in a shack at Alderley Edge. Beyond a few significant flashbacks he has no memory of his childhood adventures, but he retains the trauma of them, especially the disappearance of his twin sister Susan. Boneland takes place in the same landscape as the earlier Alderley books, but it is no longer the haunt of elves, dwarves and wizards. This book's fantastical elements arise more subtly from Susan's implicit fate (only foreshadowed in The Moon of Gomrath, although Colin's reading of the outcome is convincing in the light of what we saw there), and what emerges as the unusual nature of his analyst. There's also a series of time-hopping reversions to the prehistoric life of a man who turns out to be a Homo erectus shaman also inhabiting Cheshire, seeking a successor to his post of observing and thus maintaining the world, whose relation to the main narrative is definite but elusive. Though of no great length, Boneland is a dense, slippery text which starts off close to incomprehensible but becomes crystal clear as one learns to inhabit the storytelling. That's the kind of reading experience I always find rewarding, but it's not the light read its predecessors were. In fact, it reminded me of nothing so much as the revisionist texts which reinterpret much-loved works of children's fantasy through a filter of adult understanding and knowledge: Lev Grossman's Magicians sequence and Neil Gaiman's "The Problem of Susan" (both dealing with the Narnia books) spring most readily to mind, but one could also cite Alan Moore's Lost Girls (Alice, Peter Pan, Oz) or Geoff Ryman's Was (Oz). In most such stories, adventures are re-examined as traumatic, paradigm-shaking experiences which can neither be revisited nor fully shared, but which will colour the rest of the adventurer's life; child protagonists are followed into their problematic adulthood, with the psychological fallout of their pasts unflinchingly surveyed; and parental figures, even God-analogues, are interrogated and found wanting in benevolence and responsibility. Boneland is exactly that kind of revisitation of past innocence with a cynical half-century of hindsight -- indeed, the Alderley books are of essentially the same vintage as the Narnia cycle, with less than half a decade separating Weirdstone (1960) from The Last Battle (1956). However, Boneland has the unique qualification that it's not a piece of sophisticated fanfic based around the Alderley books, but the authentic work of their original author. If CS Lewis had survived until 2008 and suddenly written an eighth Narnia book at the age of 110, it would have been comparable. The original books are essential reading for fully understanding Garner's own Problem of Susan (although there's one non-revelation which might have been more effective if read in isolation from them). The primary source of Colin's trauma particularly makes no sense without such background knowledge: suffice it to say that what Colin thinks of as a curse may be, given its source, the nearest thing available to a blessing. The narrative is rife with this kind of unresolved moral inversion, however, and in the end the subjective ambiguity of Colin's childhood experiences grows to dominate the book. 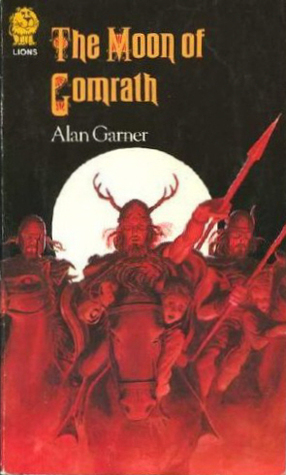 Although I loved the Alderley books as a child, I'm ashamed to say that I've not actually read Alan Garner's other adult novels, nor even his other children's novels, Elidor, The Owl Service and Red Shift. My parents told me at the age of 10ish that they'd be too difficult for me, and I somehow never caught up with them later in life. I intend to rectify this soon. Except that Lewis essentially killed off all his characters in the Last Battle. I wonder about Susan in the Arthur Ransome books as well. Well, Susan [Pevensie] herself survived. And two of the Narnia books were novel-length flashbacks anyway, so Susan: The Cair Paravel Years would have been a perfectly feasible venture. Elidor is not a lot different from the other two in most respects; it felt to me like it was aimed at the same age range. Red Shift and Owl Service were for older readers and didn't click with me at the time so I'll have to give them another shot. They're much more psychological/slipstreamy than Garner's earlier books, as I recall. Elidor and Red Shift are both beautiful books, but the latter will make you fight for the beauty in it. Owl Service is very good too but perhaps overpraised. I've only started Boneland but it immediately feels like a companion piece to Red Shift. Yes, funny that, I devoured 'Weirdstone', 'Gomrath' and 'Elidor'(aged about 11-13), struggled with 'The Owl Service' and gave up on 'Red Shift' a few pages in. I didn't approach 'Boneland' last week expecting to find elves and witches and found it a very powerful,satisfying,cathartic read. I feel ready to return to 'Red Shift' and catch up on all the other Garner stuff I've missed, as well as re-reading 'Boneland' for all the nuances (pretty inexhaustible, I would think).